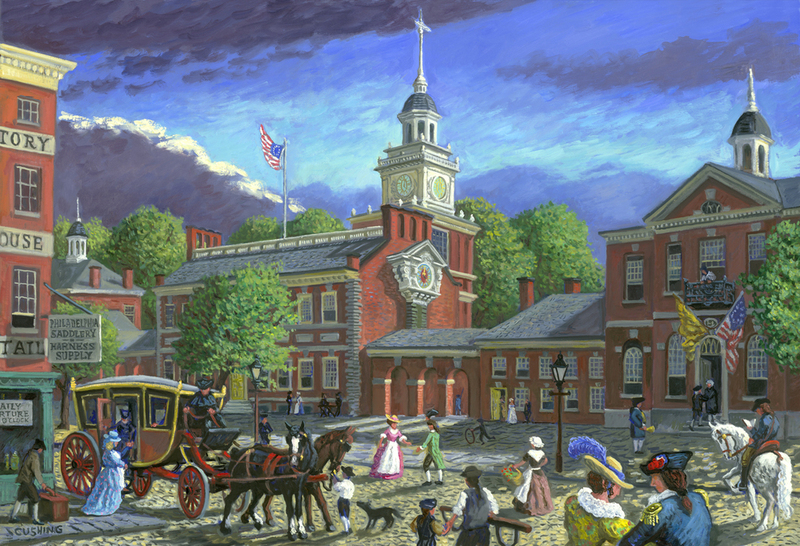 "North Broad Street, Philadelphia, Circa 1905" A recently completed large painting (fancifully) depicting the delivery of the antique cast collection to The Pennsylvania Academy or the Fine Arts, circa 1905. I have produced many "historic views" (mostly of Philadelphia) using period photographs for reference. I was guest artist at the Bellevue Building in 2004 and painted 10 large canvases in the lobby over a period of a year, depicting the Bellevue-Stratford Hotel in various periods of its history. Most of the paintings are either sold or were commissions. Many of them can be printed to order as GICLEE PRINTS on paper or canvas. Click on image to enlarge, and move cursor to the bottom of the enlarged image for specifications. For more information, call me directly at 267-679-7853. "Debutantes at the Bellevue-Stratford Hotel, Circa 1960" 32 x 40"
"Independence Hall" 32 x 52"